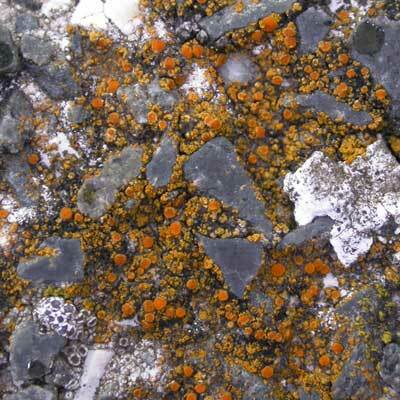 One of Ireland’s commonest lichens of walls and buildings and despite it being a crustose species, you would be forgiven for thinking that it might be one of the powder (leprose) lichens. The thallus is comprised of orange, granular areoles sometimes with minute lobes, from which arises a mass of smaller, orange soredia (clusters of fungal hyphae and algae) which can sometimes smother the entire plant except for the discs. Discs are frequent, the margins of which are also sorediate. Calcareous rocks, wall mortar, tree crevices, soil and mosses. Orange discs frequent, with sorediate margins. Simms, M. J., (2016). Caloplaca citrina (Hoffm.) Th.Fr.. [In] LichenIreland.